Personalized Golf Greens Address Sign - - pictures two golfers hard at work on the golf course. Personalized 17" x 7" rectangle address plaque holds one or two address lines. Made in USA. The one-line version holds up to five 3" numbers or thirteen 1.25" characters. The two-line version holds up to five 3" characters on line 1 and up to thirteen 1.25" characters (including spaces) on line 2. Personalization is printed in uppercase letters as shown in the sample sign. Eleven colors: AB antique brass; AC antique copper; BG black with gold characters; BS black with silver characters; BW black with white characters; GG green with gold characters; OB oil rubbed bronze; OG bronze with gold characters; PS pewter with silver characters; RG red with gold characters; and WG white with gold characters. 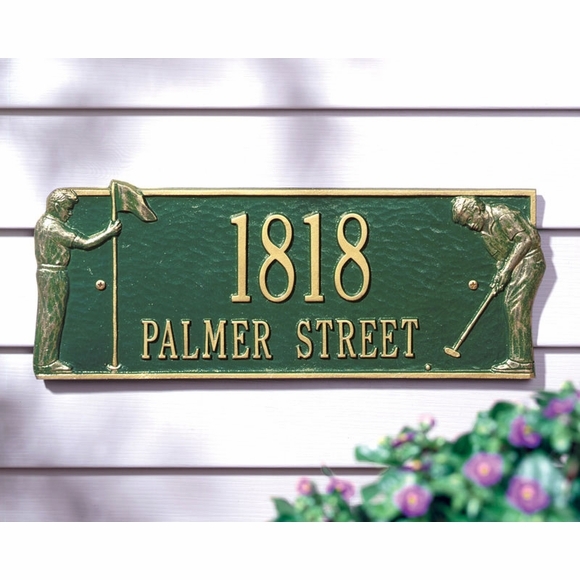 li> Dimensions: 17"W x 7"H.
Every day is a golfing day with this special for golfers address sign. This looks great. I messed up drilling holes to mount so I used double sided GORILLA tape to hold it. Holding up fine so far (3 weeks). This is a very nice plaque and I would order again. I got green with gold letters.